Eating out for lunch with colleagues is a common occurrence at work, but you might be surprised to learn that professionals who frequently eat out for lunch spend almost $50 a week (a Deli Sandwich + Drink + Tax = ~$9.27), which is almost $2500 a year, a significant impact on your budget for sure, but you’re also consuming more calories when you eat out for lunch, than you would if you bring a healthy lunch to the office. We’re not saying bring your lunch every day, after all, lunch is a great time for team building and catching-up with mentors, but we recommend supplementing at least 2-3 days a week with a healthy, budget-friendly meals, instead of eating out. So, we’ve pulled together a list of some of our favorite healthy lunch options to bring to work (and you will need to think through the logistics (refrigerators, microwaves, etc.) and the time it will take to pre-cook your meals at home). Bento boxes are common in Japanese culture for single-portion meals, which are typically rice, fish and vegetables, but bento boxes shouldn’t be limited by Japanese cuisine, they’re great for healthy pre-made office meals (breakfast, lunch & even snacks). They typically have three compartments, one large and two small compartments. 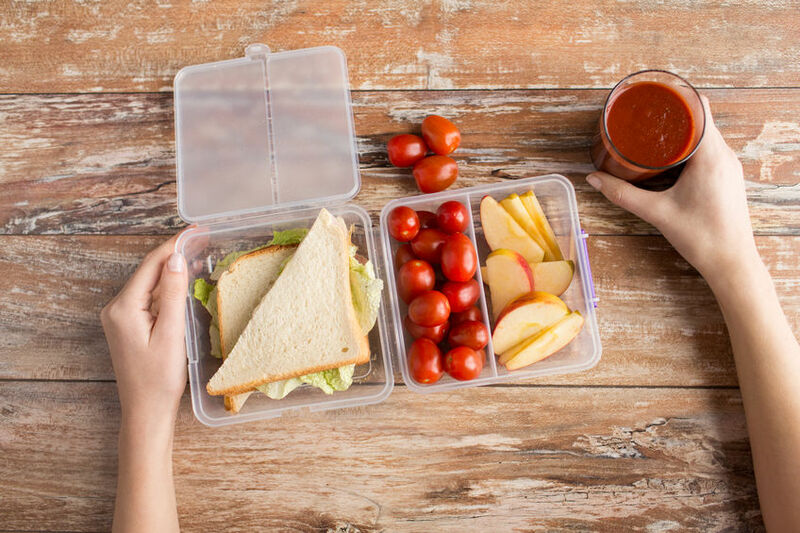 So, purchase some Bento boxes on Amazon (20-Pack, 7-Pack, 3-Pack), which will arrive in two days with Amazon Prime, and consider these Build-Your-Own-Lunch tips for putting together the perfect pre-cooked bento box lunch. Lean Proteins & Veggies: marinate (overnight) and broil a chicken breast (13-15 minutes – flip halfway) or boneless pork loin (10-12 minutes – flip halfway) and slice into fork-friendly bites for your main compartment. Add two of your favorite steamed and sliced vegetables to your second compartments – mushrooms, broccoli, spinach, asparagus, etc. For the Red Meat-Lover: eating healthy and light doesn’t mean you can’t eat red meat. For those who crave red meat or are looking to switch-up your lunch options, marinate a flank steak (overnight), broil (~8 minutes – flip halfway), and slice into small bite-size pieces for your main compartment, or purchase some lean hamburger meat (add chicken stock, diced onions, diced tomatoes, and garlic — cook in a saucepan before adding), roll into mini balls, and broil – 10 minutes – flip halfway). Add your favorite sides (black beans, brown rice, cherry tomatoes, grilled mushrooms, or steamed broccoli) to your bento box and you’re ready for a delicious meal to take to the office. A Global Delight: for a little change of pace, try putting together some globally themed meals, for a Mediterranean flavor, mix together a Greek salad (romaine lettuce, tomatoes, sliced cucumbers, onion, feta cheese, and olives) for the main compartment and add hummus and couscous to your second and third compartments. Be sure to bring a small container of light salad dressing and a slice of pita bread. This one is simple and straightforward, but it doesn’t have to be basic. Take a playbook from your kids’ lunchbox and make an adult version for the office. For your main meal, make half-a-sandwich on fresh sourdough bread or rich multigrain toast or even a delicious flavored wrap (sundried tomato or jalapeño), add your favorite mix of deli meats & veggies, and consider adding something a little special – sliced avocados, poblano mushrooms, bell peppers or an olive spread. Pair with your favorite fruits – grapes, blueberries, sliced strawberries or cherry tomatoes. And some sliced raw vegetables or nuts in your third compartment. The Turkey Reuben: if you love Reuben sandwiches, consider making a slightly healthier version for your office lunch. Swap out the rye bread for multi-grain bread or even a wrap. Use a generous portion of smoked turkey instead of corned beef, and don’t forget the sauerkraut (make sure to drain, so your sandwich doesn’t get soggy). Skip the Swiss cheese and Thousand Island dressing. And heat it up in a microwave instead of a frying pan. A Delicious Wrap: wraps are a great low-carb alternative to bread, but be sure to add some surprising elements, so they’re more than just your simple wrap. Instead of your typical mayonnaise or mustard, consider using a light salad dressing – honey mustard, ranch dressing, or raspberry vinaigrette. Add a spread of flavored hummus, olives, or sun dried tomatoes. And then top if off with some out of the ordinary vegetables – avocados, cucumbers, mushrooms, peppers or a salsa. Spicy Lettuce Wraps: crispy, delicious lettuce wraps are a great lunchtime snack. Try making some spicy mixes to fill your iceberg lettuce pockets. For Hawaiian flavored lettuce wraps, mix chopped honey ham, pineapple (or mango), jalapenos, diced tomatoes, and avocados. For a little Mexican flavor, mix fajita marinated steak, chicken or shrimp with black beans, sweet corn, pico de gallo and avocados. Fill your side compartments with fruit and nuts or maybe a light dressing to add to the top of your wraps. Cucumber & Tomato Salad: Mix together chopped cucumbers, tomatoes and red onions for the base of this salad. To add some extra ingredients consider adding basil, avocado and fresh mozzarella. Pasta Salad: There are so many pasta salad options… it’s difficult to choose just one. Pick your favorite type of pasta noodle (penne, macaroni, orzo, bow-tie, or tortellini), add some of your favorite vegetables (diced tomatoes, peppers, broccoli, and asparagus) and then add a light vinaigrette salad dressing. Potato Salad: Slice red potatoes into quarters and boil until soft. Once drained and cooled, add mustard, salt and pepper, diced sweet onion, celery, green onions, red pepper, parsley and a light vinaigrette salad dressing. So, enjoy a healthy (and budget friendly) alternative to going out to lunch every day with a delicious salad, healthy wrap or customized bento box. Try to change things up every week. If you don’t have a refrigerator at the office or close to your desk, most lunch bags have reusable ice packs which last most of the day. Be careful not to bring anything that has a strong smell, especially if you work at a small office. Don’t miss out on an important (impromptu) lunch outing because you brought your lunch to work. Don’t let anything stack-up at your desk. Make sure to throw away everything in a timely manner and bring any bags or storage home every day to clean and put away.